Many kids (and adults) learned more about science and technology at the 2-week-long USA Science & Engineering Festival this month in Washington, D.C. The event featured hundreds of activities, including performances, workshops, demonstrations, tours of mobile labs and interactive games. A number of these were hosted by NIH, which was also one of the event sponsors, and most of its components. The festival wrapped up last weekend with a grand finale expo on the National Mall. On Sunday, I helped host the NIGMS booth, where we presented a computer activity called “Supermodels of Science.” It showed how model organisms—from slimy worms to furry mice—help scientists learn more about human health. The kids were most excited about responding to the quiz questions at the end of each segment. They also were very interested in how scientists use GFP to make organisms glow different colors. Other NIH activities included a musical performance by NIH Director Francis Collins; the National Human Genome Research Institute’s “Strawberry DNA Extraction,” a hands-on lab experiment where visitors used a soapy mixture to remove DNA from mashed strawberries; and the National Institute on Deafness and Other Communication Disorders’ “It’s a Noisy Planet,” where staff increased the volume on an iPod to demonstrate dangerous noise levels. The festival’s turnout was excellent—about 500,000 people attended the weekend event. The kids were excited about science and eager to learn, and the volunteer staff members were thrilled to teach them about the research we support. We’ll post the “Supermodels of Science” activity on the NIGMS Web site soon, and you’re welcome to use it in your own educational outreach efforts. Last week, President Obama announced the 2010 recipients of the National Medal of Science and the National Medal of Technology and Innovation . The 10 winners of the National Medal of Science include long-time NIGMS grantees Steve Benkovic from Pennsylvania State University and Susan Lindquist from the Whitehead Institute, MIT. As always, I am pleased when our grantees are among the outstanding scientists and innovators recognized by the President in this significant way. Revised applications must be submitted no later than 37 months after submission of the preceding version. In most cases, the clock will start at the original receipt date. For special cases, please refer to NOT-OD-10-140. Submissions for deadlines after May 7, 2011, must use an updated forms package (ADOBE-FORMS-B1). For deadlines before then, applicants may use either the new forms package or the current one, ADOBE-FORMS-B. There are some exceptions: K, T, D or F series applications submitted for deadlines on or after January 25, 2011, must use the new forms package. For more information, see NOT-OD-11-008 and NOT-OD-11-007. 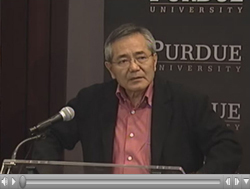 The Royal Swedish Academy of Sciences announced today that long-time NIGMS grantee Ei-ichi Negishi from Purdue University will share the Nobel Prize in chemistry with Richard Heck from the University of Delaware and Akiri Suzuki from Hokkaido University in Japan for “palladium-catalyzed cross couplings in organic synthesis.” All of us at NIGMS congratulate them on this outstanding recognition of their accomplishments. Carbon-carbon bond-forming reactions are the cornerstone of organic synthesis, and the reactions developed by these Nobelists are widely used to produce a range of substances, from medicines and other biologically active compounds to plastics and electronic components. NIGMS supports a substantial portfolio of grants directed toward the development of new synthetic methods precisely because of the large impact these methods can have. I have personal experience with similar methods. I am a synthetic inorganic chemist by training, and a key step during my Ph.D. training was getting a carbon-carbon bond-forming reaction to work (using a reaction not directly related to today’s Nobel Prize announcement). I spent many months trying various reaction schemes, and my eventual success was really the “transition state” for my Ph.D. thesis: Within a month of getting this reaction to work, it was clear that I would be Dr. Berg sooner rather than later! I’d also like to note that this year’s Nobel Prize in physiology or medicine to Robert Edwards “for the development of in vitro fertilization” also appears to have an NIGMS connection. Roger Donahue sent me a paper he coauthored with Edwards, Theodore Baramki and Howard Jones titled “Preliminary attempts to fertilize human oocytes matured in vitro.” This paper stemmed from a short fellowship that Edwards did at Johns Hopkins in 1964. Referencing the paper in an account of the development of IVF, Jones notes that, “No fertilization was claimed but, in retrospect looking at some of the photographs published in that journal (referring to the paper above), it is indeed likely that human fertilization was achieved at Johns Hopkins Hospital in the summer of 1964.” The paper cites NIGMS support for this work through grants to Victor McKusick. In all, NIGMS has supported the prizewinning work of 74 grantees, 36 of whom are Nobel laureates in chemistry. It’s the 1st of October, and there’s a Nobel buzz in the air. We’re eagerly awaiting next week’s prize announcements and hoping to see more of our grantees added to the list. But we’re also feeling the Nobel excitement in another way: the opening of the nomination process for your graduate students to attend the next Lindau Nobel Laureate Meeting. Nominations are due from your universities on November 1. Through this extraordinary opportunity, the most exceptional young researchers go to Lindau, Germany, to engage with Nobel Laureates and meet their peers from around the globe. The upcoming meeting takes place June 26-July 1, 2011, and will feature Nobel prizewinners from physiology or medicine. A student from last year’s meeting said, “Lindau is much more than a meeting. It is an experience that will change how you look at science and inspire your career.” Other students have told us that it’s “amazing” and “life-changing,” giving them extensive opportunities to network and have focused discussions with the Nobelists. John Schwab and Ravi Basavappa, NIGMS program directors who accompanied the students in past years, came back from the meeting equally charged up. You can get a sense of what the excitement is all about by viewing a video about the meeting . If you would like to nominate one of your students, visit http://www.orau.org/lindau/ for details, instructions and forms. Your universities must submit the applications via this Web site by the November 1 deadline. Please note that your university president or designee can submit only two candidates to be considered for NIH support. Eligible students can be supported by any NIH institute or center, as long as it funds the research the student is involved in or supports the student through a training award. Universities may also submit up to six additional nominations (two to each of the three other sponsors—DOE, ORAU and Mars, Inc.). The application process has three phases. First, candidates are selected by their universities for consideration by NIH. Second, NIH selects approximately 40 student nominations, which represents more than half of the U.S. delegation. The last phase is conducted by the Lindau Meeting. Selection is a highly competitive process, and we’re counting on you to identify the best candidates to represent U.S. science next year! At the recent NIGMS Council meeting, I gave an overview of a new section of the NIGMS Web site called Evaluation: Measuring What Works. 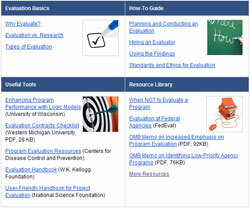 In addition to offering tips on planning and conducting evaluations, the section provides links to “how-to” guides, tools and other resources. I invite you to take a look at the material and send your comments and suggestions via the feedback form link (no longer available). Why did we develop this new Web site section? Increasingly, the Office of Management and Budget and other entities are calling for the use of formal program evaluation to help determine if programs are operating efficiently and achieving their goals. Some NIGMS research and training grant programs already include an evaluation component. If you’re an applicant or grantee on one of these programs, you may find our new online program evaluation resource useful.